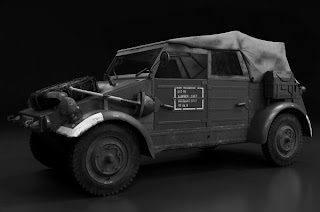 Weird WWII: Battleground Weird WWII: Kfz 1 "Kubelwagen"
Battleground Weird WWII: Kfz 1 "Kubelwagen"
Notes: These rules are for the various models of the German's light cross-country passenger car, the Kubelwagen (bucket seat car). Be sure to pick up the core Battleground WWII rules to get the most outta these rules. Vehicle Cart: No vehicle chart is needed; just use the soft-skinned vehicle rules as normal. Radio: The Type 82/1 is fitted with a radio as basic issue but all other models are not and will suffer the No Radio penalty as such. 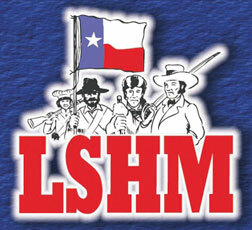 Light Machine Gun: Most types are capable of mounting a light machine gun in a pintel mount. The weapon has a 180-degree field of fire to whichever direction it is facing and is manned by one of the vehicle's passengers. Availability is a 5. 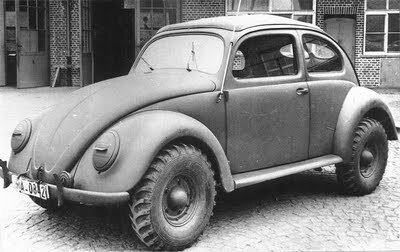 Sand Tires: In North Africa, many of the Kubelwagens were fitted with large balloon-like tires that helped the vehicle move better in the desert sands. 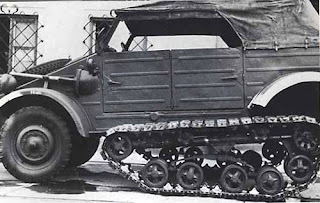 If any Kfz 1 is fitted with these tires, they will be able to move at 3/4 their normal movement instead of 1/4 and receive a -1 bonus when making Bog Checks when moving through sand. Availability is 10 for units of the Afrika Korps and a 5 for any theater. 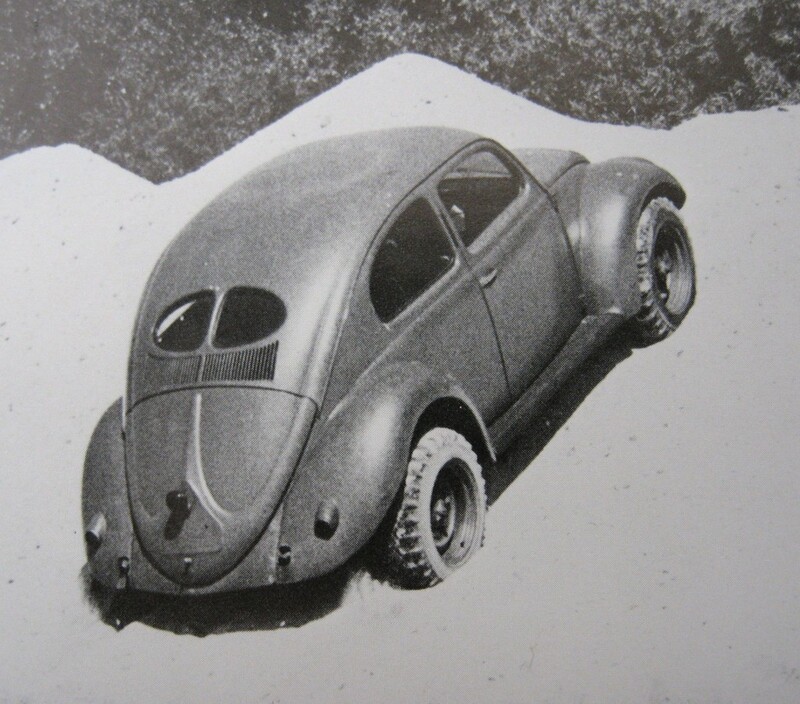 Rieger & Dietz Gripping Wheels: These wheels were meant to allow light vehicles to move easier through snow but the actual trails showed they didn't really work to well. Anyway, this is WWWII so make them work cause they look pretty cool. Vehicles fitted with these will allow it to move its full rate in snow, 3/4 speed in medium snow and at its 1/2 speed in deep and very deep snow. 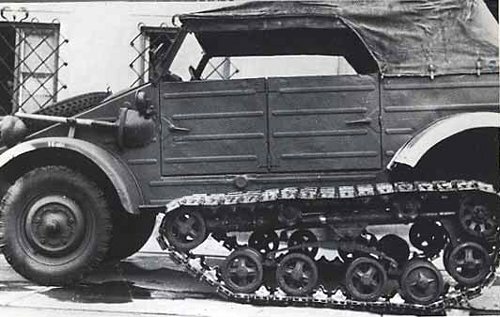 The wheels also give the vehicle a -1 bonus when making Bog Checks in any depth of snow. Availability is 5. 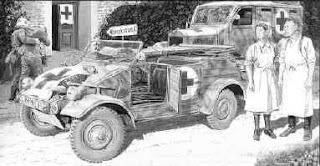 Armored Cab & Ablative Armor: Many vehicles were armored in the field by their crews by installing an armored cab and armor plat to the front to protect the vehicle's driver. 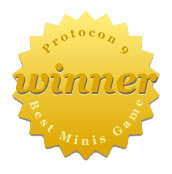 Note that the armored cab modification will be WYSIWYG so determine the locations covered by the actual piece on the battlefield. Availability for this field modification is a 3 or less. Armor will only offer the crew or passengers a +5 cover modifier at best. Type 62: Prototype later designated the Type 82.Type 67: This model is a light ambulance capable of carrying 2 stretcher litters along with an attendant and driver. 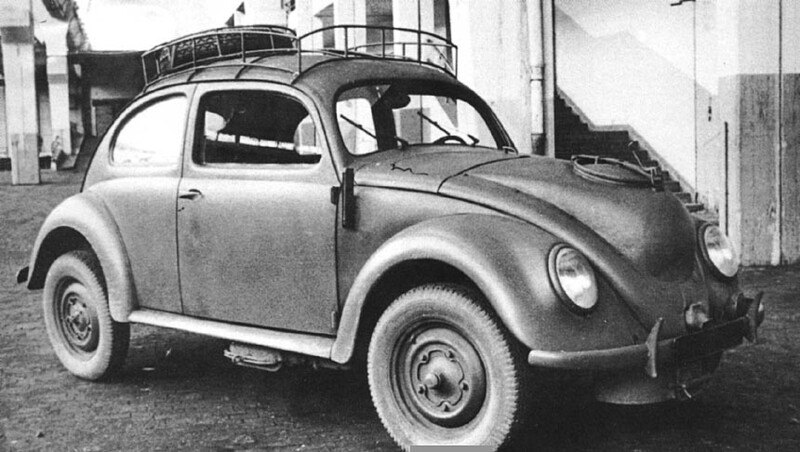 Type 82: This is the most common light passenger car version. 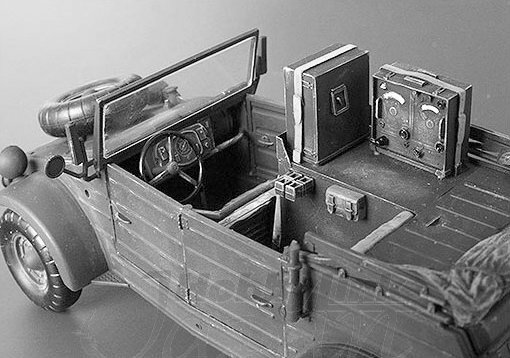 Type 82/1: This model mounts a radio set and is often used as a command vehicle. 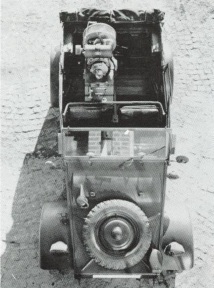 The radio set is mounted in the rear with the radio operator taking the other rear set. 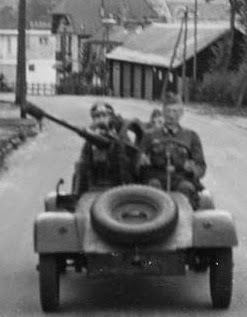 Type 82/2: This model mounted a large air siren in the two right side seats. 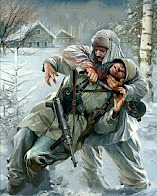 I'm not exctly sure what it was used for but this is Weird War so go to town. 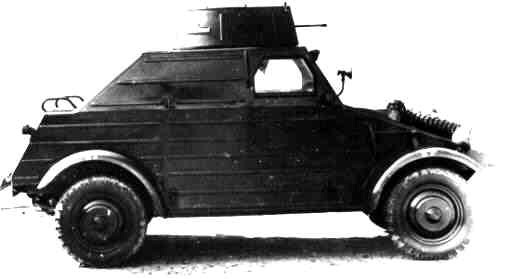 Type 82/3: This model uses a roof-mounted turret and other panels to disguise the vehicle as an armored car. 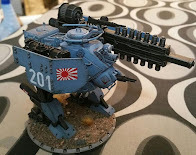 The turret mounts a functional LMG and is fully functional but the vehicle is not armored in any way. 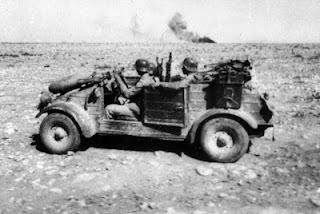 The LMG is manned just as any other LMG mounted within the Kubelwagen. 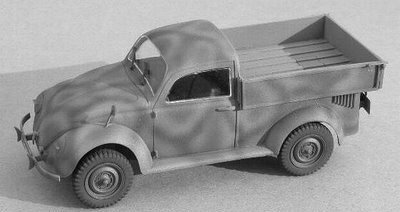 Misidentified: If a Commander is using this type, they may represent it as any light armored car model that is considered of small size. This vehicle will act like the Type 82/3 but will look like the armored car until the vehicle is successfully identified for what it is. 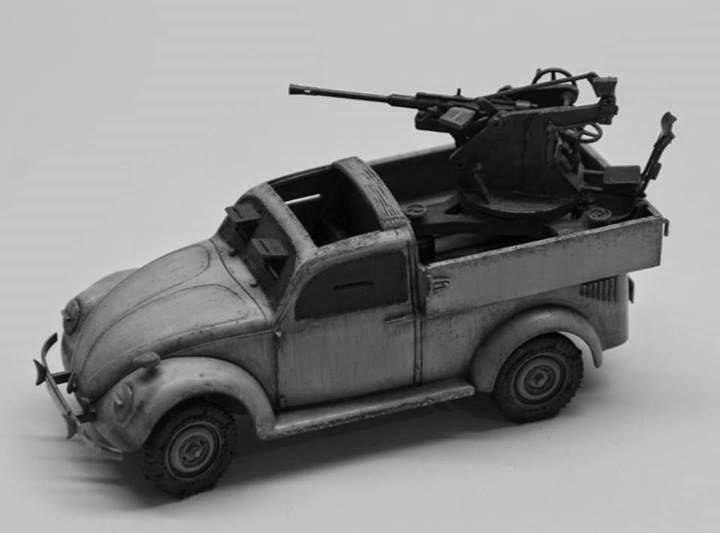 Type 82/5: This model has the Type 82 chassis with a modified Beetle body with a truck bed used for transporting cargo. Alternatively, the vehicle can hold up to 8 passengers in the bed. Type 82/5 Flackwagen: This model fitted a light-weight Flak 30 in the vehicle's cargo bed. The weapon has a 360-degree field of fire. This modification is rare and its Availability is a 5 or less on any front. 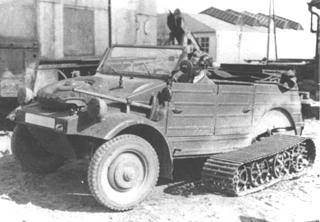 Type 82/6: This is another model with the Kubelwagen chassis with a modified Beetle body. The vehicle's van conversion is used to carry cargo but alternatively can carry up to 4 passengers instead. 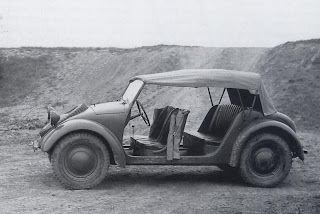 Type 82/7: This is a modified Beetle body with canvas top with the Kubelwagen chassis. 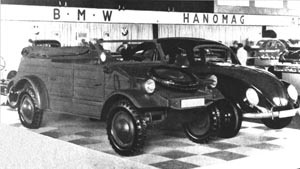 This model is used as a command vehicle. Type 82/8: This model is a regular Type 82 but instead with a body made of wood. 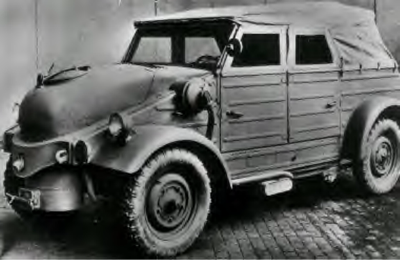 Type 86: This is a full 4x4 model with the Type 82 chassis. This vehicle will receive a -1 bonus when making Bog Checks in rough terrain. 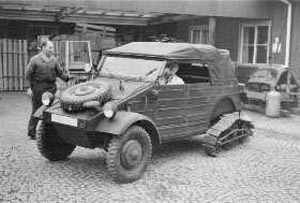 Type 87 "Kommandeurwagen": This is model has the 4x4 Kubelwagen chassis but fitted with a Beetle body and used as a command car. This model will receive a -1 bonus when making Bog Checks in rough terrain. Type 98: This is another model with a Kubelwagen 4x4 chassis with the Beetle cabriolet body. This model will receive a -1 bonus when making Bog Checks in rough terrain. Type 155, 155/1, 155/2, 155/3 & 155/4: These models replace the rear wheels with a set of tracks. Although all the models use different rear tracks, they will act in the same manner. Treat this vehicle as a half-track for gaming purposes. Type 157: This model is designed to travel on railroad tracks and uses the body of the Type 82 and 87. 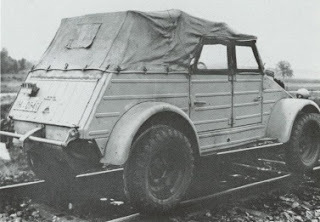 The vehicle will take an action to get on and off a track. The vehicle can move like normal when off and will move at 10" per action when on a track. Type 164: This was a prototype 6-wheeled car that had dual driving positions that allowed it to be driven in either forward or reverse at full speed. 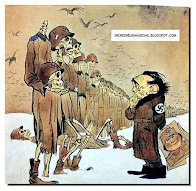 Although it never made it past the drawing board, this is Weird War so go to town! Reverse Drive: These cars are capable of driving forward and reverse at its full speed. There is a forward and rear transmission and driver's position in each vehicle that allows the crew to get out of trouble as fast as it got into it. Either driver can take over driving at the beginning of any subsequent action where the other driver has stopped the vehicle. It is not possible for the drivers to control the vehicle in the same action or for the vehicle to move both forward and reverse in the same action. The vehicle must come to a halt before the other driver takes control. If one of the drivers are disabled or their position it unmanned, the other driver may only move half the vehicle's normal speed in that direction like any other vehicle moving in reverse. 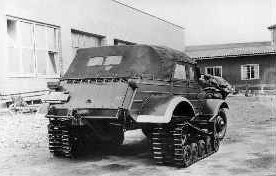 Type 179F: The model is a amphibious prototype that would end up as the Kfz 1/20. 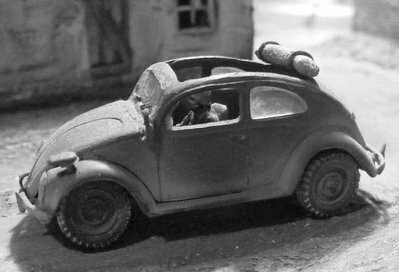 See the Schimmwagen rules for more details. Types 230 & 239: These models use the 82 and 87 bodies and run off wood-gas generators but will not alter their game characteristics. Type 231/332: This model uses the 82 and 87 bodies and runs off anthracite coal but will not alter their game characteristics any. Type 240: This model uses the 82 and 87 bodies and runs off natural gas but will not alter their game characteristics any. Type 276: This model was designed to tow the PaK 37 anti-tank gun. 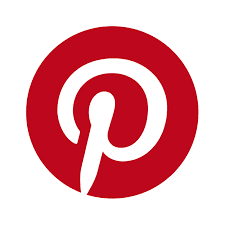 Treat as a normal prime mover. Type 331: This model uses the 82 and 87 bodies and runs off acetylene gas but will not alter their game characteristics any. Types 89, 106, 107, 115, 126, 177, 179, 198, 235, 276, 278, 307, 309: All these models had slight modifications to various part of the vehicles internal design but nothing to really make it have any special rules to note. Just treat all these models as a Type 82. 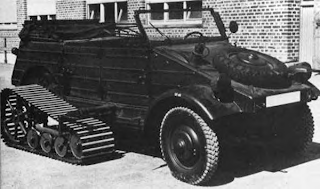 Flakwagen: This mode was a field modification and was not a common sight. Availability is a 5 on all fronts. 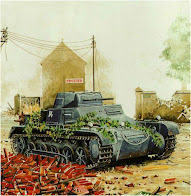 Wargaming Piece: You can find all sorts of Kubelwagen and Beetle types in 1/48 kits so just do some Google-Fu and see what you can drum up. ***Only for Kubelwagen-style bodies. 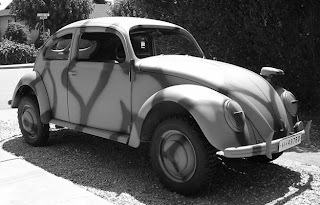 The Beetle body will not be abe to mount a LMG.